You've been looking forward to being with your grandchild for days, but it soon becomes apparent that your darling is having a bad day. What's a grandparent to do? 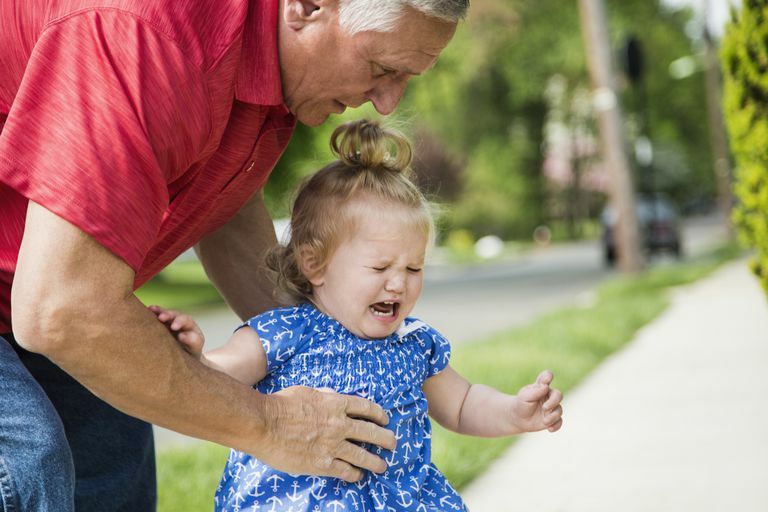 Whether your grandchild is a newborn or considerably older, every grandparent needs a few tricks for soothing a fussy grandchild. Which strategies are best will depend upon several factors, including the age of your grandchild and your physical condition. The wail of an infant can be especially upsetting to a baby's grandparent. If it's been a while since you handled an infant, you may be unsure of what to do. If you are going to be babysitting your grandbaby, it's always a good idea to get advice from the parents before they drop off the baby. Try their suggestions first. Here are some items that might be on their list. Feeding. A baby who was fed recently and who ate well is unlikely to be hungry. A baby suffering from colic can appear to be ravenous, gnawing on a fist and crying inconsolably. Feeding will not help a colicky baby. Still, it's okay to try a small feeding. Sometimes a baby shouldn't be hungry but is just the same. Motion. Gentle movement is great for calming babies. Walking with the baby while gently bouncing is the surest method of soothing through movement, but this method is fatiguing. Try a rocking chair, or bouncing while sitting. Baby swings work, too, but they can be hard to get a baby into and out of. Soft noise. Singing or humming sometimes soothes a baby. Don't worry about your ability to carry a tune. Recorded music doesn't have the same effect, for some reason. Clothing adjustment. Sometimes a baby is too hot or too cold. Although swaddling an infant can be calming, by the time babies are a few months old, they are more likely to enjoy being naked or wearing just a diaper, as long as the air is not chilly. Going outside. If the weather is favorable, taking the baby outside can be distracting. Be sure to shield the baby from the sun if you end up staying longer than a few minutes. A short trip in a stroller or pram can be calming, too. Wearing the baby. Many modern parents practice babywearing using a sling of some type. They find that babies fuss much less when they are kept close to a familiar body. That can work for grandparents, too, especially with infants who aren't too heavy. It's best to have help from a parent the first time you try it, so you can practice getting the baby in and out of the sling safely. It's possible that none of these will work. In the case of a baby who won't stop crying, you should call the parents and let them decide what to do. In such cases, it's important to understand that you probably did nothing wrong. Some babies are very sensitive to changes in their schedules and environments. Also, around the age of six months, some babies begin to exhibit separation anxiety. They may act as if they don't like their grandparents, but they are probably just reacting to being separated from parents. Toddler grandchildren tend to be energetic and strong-willed. Most of the time that means that you will have a great time with them. Sometimes it means the opposite. When toddlers get cranky, they can be hard to soothe and may descend into a full-blown meltdown. Here are some ways to prevent that from happening. Food. Toddlers tend to eat erratically. If they get grouchy, they may be hungry. Try a healthy snack, or bump up mealtime if it is getting close. Do not, however, try to bribe them with sugary treats. That sets a bad precedent and doesn't go over well with most parents. Rest. You may have a hard time getting a tired toddler to go to sleep, but you can at least promote a short rest. Try reading a favorite book or listening to music. In a pinch, put on a favorite movie or television show. The more familiar it is, the more relaxing it will be. Most children enjoy watching the same things over and over, just as they can read a favorite book many times. Activity. Sometimes the problem isn't not enough rest, it's too much routine. Do something different, especially if it is outdoors. Go for a walk, blow bubbles, make mud pies or turn on the sprinkler. Give choices. If you ask cranky toddlers if they want to do X, the response is almost certain to be no. If you ask toddlers to choose between X and Y, their curiosity and their desire to be in control are engaged. Parents can't afford to give choices all the time, but grandparents usually can. Humor. Getting toddlers to laugh is a surefire way to change the atmosphere. The trick is knowing how to tickle their funny bones. Slapstick usually works, as do funny noises. When school-age grandchildren get out of sorts, they are less likely to act out and more likely to withdraw. That can be just as frustrating for a grandparent, who wants to have quality time with a grandchild. Just as with younger children, be sensitive to whether a child is hungry or tired. If you're like most grandparents, you really don't like to discipline grandchildren, although sometimes it is necessary. Avoid that scenario by trying these strategies. Be prepared. Have some activities in mind before your grandchild arrives. Sometimes it helps to have a puzzle, science kit or paints casually set out on a table. If you ask a grumpy grandchild if they want to do a particular activity, they may say no, but they often can't resist picking up something that is already set out. By the same token, don't prepare such an elaborate activity that you will be upset if your grandchild turns you down. Set expectations. Children are much less likely to misbehave if they know what behavior is expected of them. Setting expectations is especially important if you are taking your grandchildren somewhere unfamiliar, or if your expectations are different from expectations at home. If meals in your house are consumed at the table, for example, it's okay to spell that out. Avoid transition troubles. Some children like to know what they are going to be doing ahead of time. Children with this trait will not be happy if they expect a quiet afternoon at home and are told that an elaborate outing has been planned. In a similar vein, they need to be warned about departure times, bedtimes and other upcoming events. Watch for issues. Older children sometimes have problems that affect their mood. These can be issues with family members but are just as likely to be peer-related. Grandparents can try to gently determine what is bothering a grandchild. Sometimes simply talking about it can help. Of course, if you learn anything really disturbing, you must inform the parents. Have a plan for electronics. When grandchildren start showing up at your house with digital devices, you have a decision to make. Unlimited use of electronic devices can mean very little bonding time for grandparents and grandchildren, but insisting that they are put away can result in some very rebellious grandchildren. It's best to have a plan. If you have active or outdoor activities planned, most children will happily put away their electronics, especially if they know they'll be allowed to use them later. Of course, some grandparents and grandchildren enjoy sharing electronic amusements. That's fine, but most of the time you should work in other activities, too. Grandchildren aren't the only ones who can be out-of-sorts. If you're going to be entertaining the grandchildren, try to get rest beforehand. Don't skip meals, and be sure to stay hydrated, especially if you are outdoors. You'll be more patient with the grandchildren. A grouchy grandchild can often be maneuvered into leaving a bad mood behind, but a grouchy grandparent will never be able to do the trick!